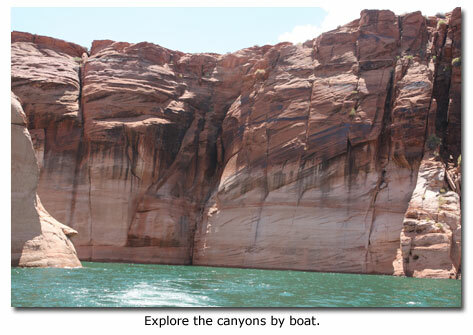 By far the most popular activity in Glen Canyon National Recreation Area is boating. By private boat or by a rental from one of the park's conssesioners, almost two million visitors enjoy the deep turquoise waters of Lake Powell yearly. At Lake Powell there are five marinas where you can launch your private vessel. See the list of marinas below. 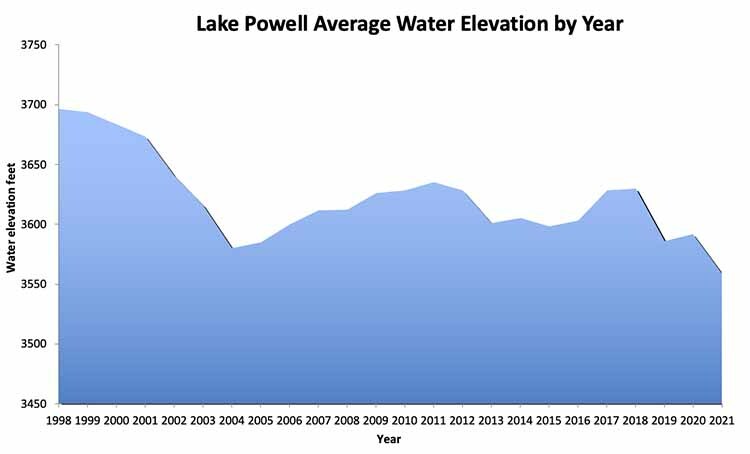 Zebra Mussel Advisory - Zebra mussels are an exotic species that can pose a threat to the waters of Lake Powell and those who use them for recreation, irrigation, or power generation. If your boat has been in Zebra mussel infected waters, please read this important advisory. Play it safe - take the Utah PWC certification course. Wahweap main ramp is open with concrete surfaces. Stateline Ramp is open with concrete surfaces. The pumpout at Wahweap is open while the pumpout at Stateline will open for the season by Memorial Day. Stateline-A (Alternative Ramp) is closed to launching of any vessel but is open as a day use area. Boat and land-based fuel are available. The Wahweap Lodge is open for overnight accommodation and the Rainbow Room Restaurant is open. Wahweap Marina, 5.5 miles from the Carl Hayden Visitor Center along Lakeshore Drive, is operated by ARAMARK, the park concessioner. It provides a variety of services, including: lodging, food services, gift shops, 2 campgrounds (one with hook-ups), laundry, showers, and a service station. Full marina services include: slips, buoys, boat rentals, tours, repairs, dry storage and fueling. 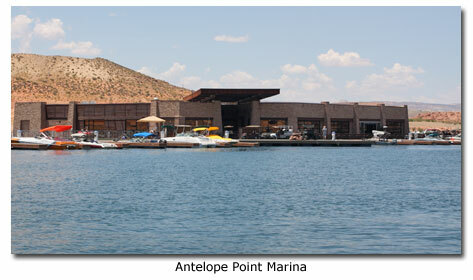 Bullfrog Marina is approximately 95 miles up Lake Powell from Glen Canyon Dam, with the Waterpocket Fold on one side and the Henry Mountains on the other. It offers the largest array of services of any of the uplake marinas. Bullfrog main ramp is open with a concrete surface to the water’s edge. The Bullfrog pumpout is operational and boat and land-based fuel are available. This same building also houses National Park Service offices for the uplake District and Bullfrog Subdistrict. In addition, a medical clinic operates from this building from May through September. A physician's assistant staffs this facility and provides emergency medical care. NPS medics are on duty year-round. Emergency medical evacuation by helicopter and fixed wing aircraft is available. The National Park Service also provides a launch ramp, portable toilet dump station, picnic area, fish cleaning station, and paved landing strip for aircraft. The concessioner, ARAMARK, provides a full complement of visitor services, including: a lodge, housekeeping units, food services, gift shop, grocery store, 2 campgrounds (one with hook-ups), laundry, showers, service station, boat rental, boat tours, and boat repair. There is a post office in Bullfrog. The State of Utah maintains a regularly scheduled ferry, capable of carrying cars, trucks, rv's and trailers, which runs between Bullfrog and Halls Crossing. This is a fee service and is available on a first come, first served basis. The ferry is occasionally out of service for repairs. If ferry service is crucial to your trip, we recommend you call ahead to verify that it is in service. Halls Crossing is located on Lake Powell, about 95 (153km) miles upstream from Glen Canyon Dam, directly across the lake from Bullfrog Marina. The National Park Service maintains a Boater Contact Station at Halls Crossing that is staffed intermittently during the summer. It also provides a launch ramp and free boat pump-out station. Halls Crossing Ramp is open with a concrete surface. All marina concession facilities are open, including the fuel dock and marina store. Pumpout facilities are operational near the public launch ramp. he ferry is occasionally out of service for repairs. If ferry service is crucial to your trip, we recommend you call ahead to verify that it is in service. The State of Utah maintains a regularly scheduled ferry, capable of carrying cars, trucks, rv's and trailers, which runs between Halls Crossing and Bullfrog . This is a fee service and is available on a first come, first served basis. The ferry is occasionally out of service for repairs. If ferry service is crucial to your trip, we recommend you call ahead to verify that it is in service. At Dangling Rope, the National Park Service provides a ranger station, restrooms, free boat pump-out station, and emergency communications. During the summer season, interpretive rangers are stationed at nearby Rainbow Bridge National Monument. Rangers from Glen Canyon National Recreation Area patrol Rainbow Bridge National Monument and provide visitor information, even though the monument is a separate unit of the National Park Service and is subject to more stringent regulations regarding visitor use & activities than is Glen Canyon NRA. Dangling Rope is only accessible by water. There is no boat launching available. ARAMARK, the park concessioner, provides limited services at Dangling Rope, including: boat fuel, minor boat repair, and a supply store including some groceries. This is the only place to get boat fuel between Wahweap and the Halls Crossing/Bullfrog area. There are currently no water-based facilities within the Hite Ranger District except a small boat dock. The North and South public launch ramps are available; however both launch ramps are gravel, so boat launching is at your own risk. Watercraft launching at Farley & Blue Notch Canyons is also at your own risk. The river rafting take out ramp is available. Four wheel drive vehicles are recommended for all launching. Contact Hite Ranger Station for current conditions. Watercraft launching within the Hite Ranger District must be certified free of invasive species. Self-certification is possible when on-call boat inspectors are not available. NPS Mussel interdiction rangers will be on duty 7:00 a.m. to 5 p.m. daily for boat inspection and decontamination during summer season and on call during winter season.